Given that you have fully understand, by reading the section ”payoff & profit diagrams”, what a payoff and profit diagram is, we will now explain thoroughly how someone can interpret a more complex payoff diagram. The purpose of profit diagrams is to show us at a glance, how big is the maximum risk and maximum profit of a strategy. Below, we can see the profit diagram of a long call butterfly strategy. At this point we don’t care about the strategy itself and how it is constructed. Our purpose is to easily interpret a profit diagram no matter how complex a strategy is. The long call butterfly strategy has three strike prices with the one of them in the middle. Point A denotes the maximum profit/share ($2.14). The projection of the blue line from point A to the horizontal axis shows us one of the three strike prices (apparently the one in the middle), which is at point H or $25. Generally, the projection on the horizontal axis of the points at which two lines are met, is giving us the strike prices of the strategy (they might be more than one as in the above example). At point B we have the lower strike ($22) and at point E the higher strike price ($28). So, what the profit diagram tells us about maximum losses and profits at expiration? It tells us that at point A we have the maximum profit ($2.14/share). For this to happen the stock must be at the middle strike price at expiration ($25). We have maximum losses ($0.86/share) if the stock price at expiration is above the higher strike price ($28) or below the lower strike price ($22). We have also two breakeven points. The one is at $22.86 and the other is at $27.07. 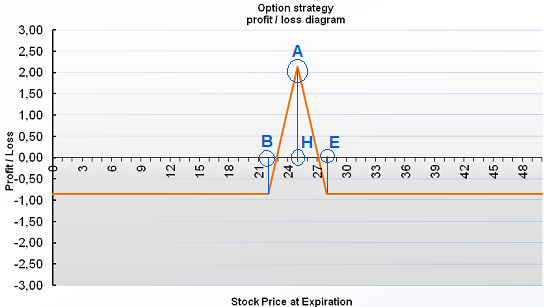 As we can see from the profit diagram the long call butterfly strategy has limited profit and limited loss.